Click here to request information on our innovation services and programs. 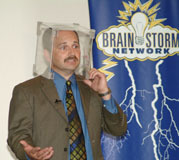 If your company needs More Profitable Ideas at your next sales meeting or industry event, invite John Storm to unleash a ThunderStorm of Fresh Ideas. John is a subject matter expert (SME) in the fields of innovation, brainstorming, and creative thinking. When your people are "stuck" and need a good mix of BrainJolts and ThunderBolts (Challenge & Ideas), coupled with learning innovative new tools and techniques, contact John to see if there is a good "fit" between what you need and what he delivers. Customized innovation and brainstorming training based on your specific needs. Balanced mix of learning and collaboration. Focused, yet fun. Walk away with brainstorming techniques your team can use everyday to produce More Profitable Ideas. Professional ideation facilitation. Focused on your outcomes. Time-saving tricks. The Results? New perspectives, strategic thinking, building your Idea Pool, & BIG breakthroughs. Are you facing Big Challenges and need BIGGER Ideas? Dig. Dream. Discuss. Determine. Do. Borrow John's brain to help you create Atmospheres of Innovation™. Face to face or your digital choice (phone, Skype, video, email).